Using the last game for rules of thumb we decided to throw points values out of the window. 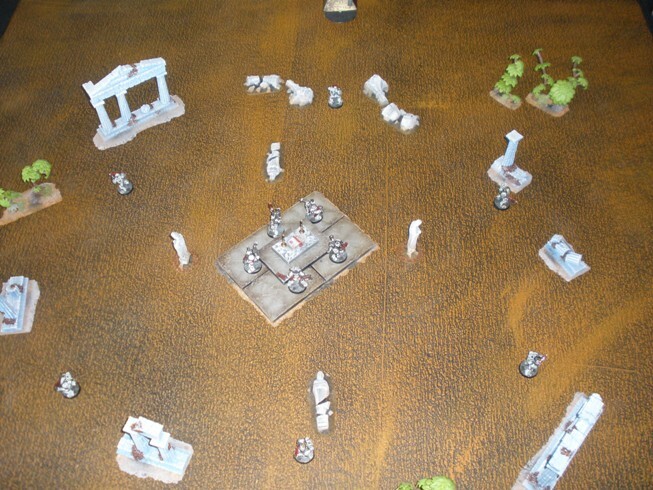 We then tweaked the scenario to represent the disruption by Harlequins of a daemonic summoning ritual by the Sin-Eaters. 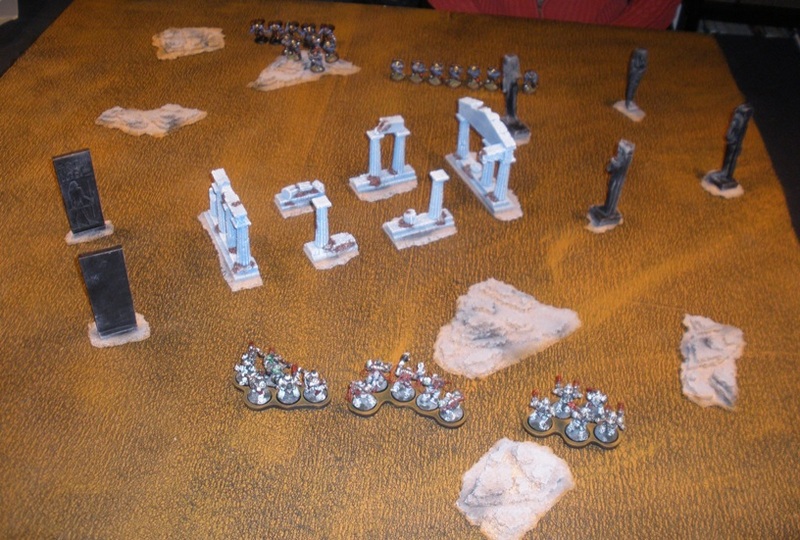 The main reason for that scenario was that I wanted to use some of the daemon and other miniatures that I painted for the army years ago that never proved viable enough for regular play. It is always fun going back to play with figures that were fun to paint that never got much table time for whatever reason. 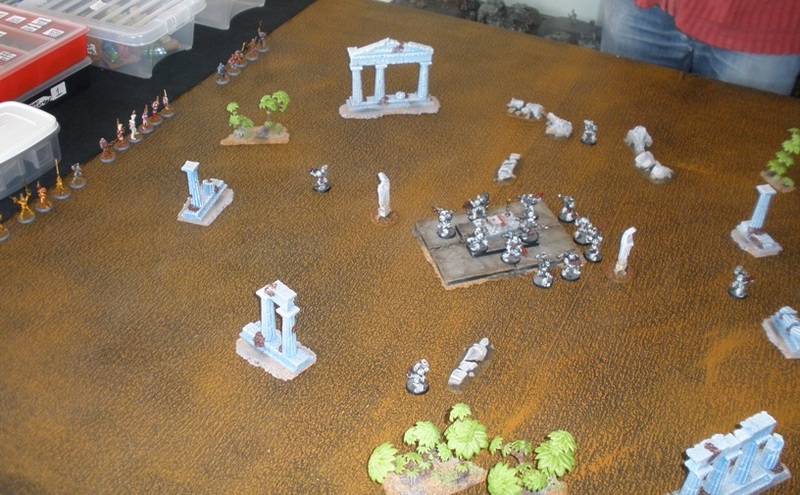 We set up as above but doubled the number of sentries as the Harlequins had too easy a time avoiding them in the previous game. Nonetheless two troupes made short work of the sentries on the Western side. That didnt slow down the summoning ritual though. Swarms of Nurglings and and a group of Plaguebearers poured through the rift that was being opened by the Plague Marines. Sin-Eaters Bikers also came in from the East in support. 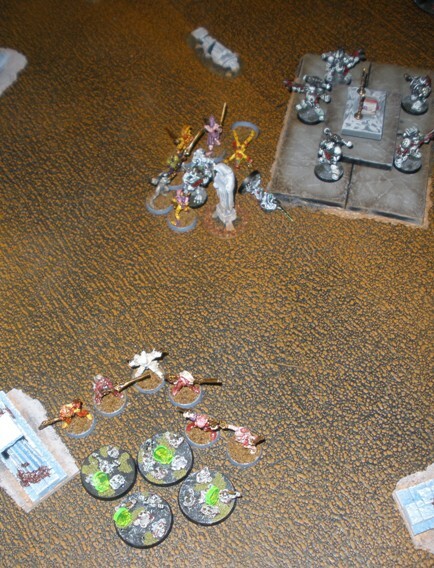 Nurglings swarmed over one squad of Harlequins, catching them unawares and killing them unexpectedly. 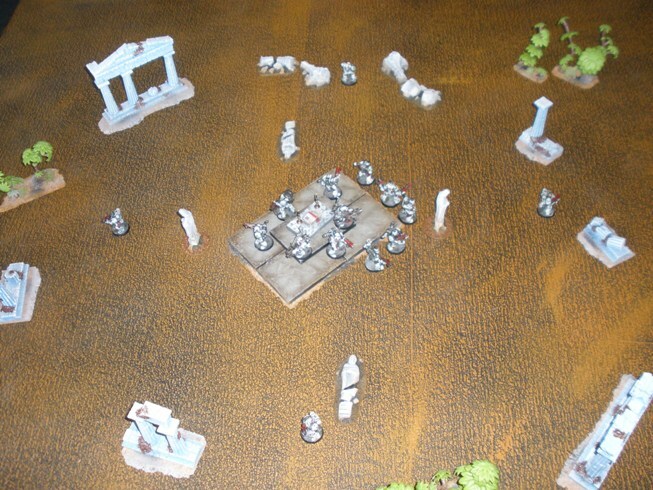 The fight between the Plaguebearers and the second troupe caused casualties on both sides. 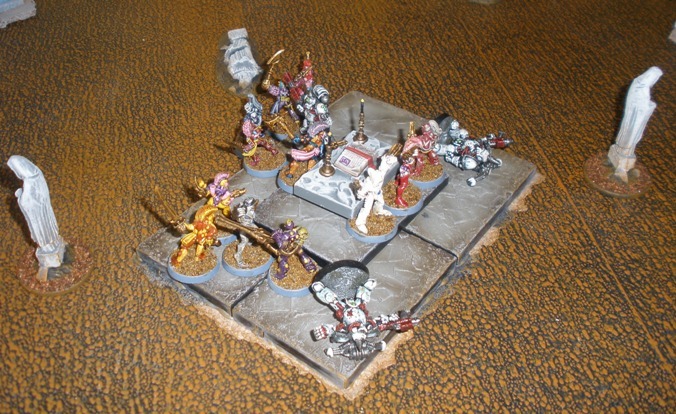 Eldar Guardians from the Kouranaya Craftworld stepped through their webway portal (the tacky looking golden pyramid) to support the Harlequins. The Sin Eater bikers adjusted to an intercept course. Tough as they were the Plaguebearers were finding it difficult to withstand the repeated hit and run attacks from the Harlequin troupe. 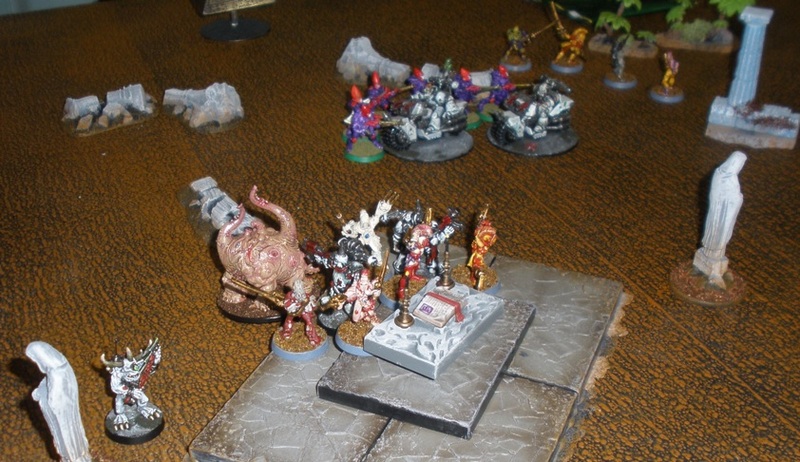 The Nurglings unexpected run of luck didnt hold and a fully expected obliteration occurred at the hands of the third troupe. 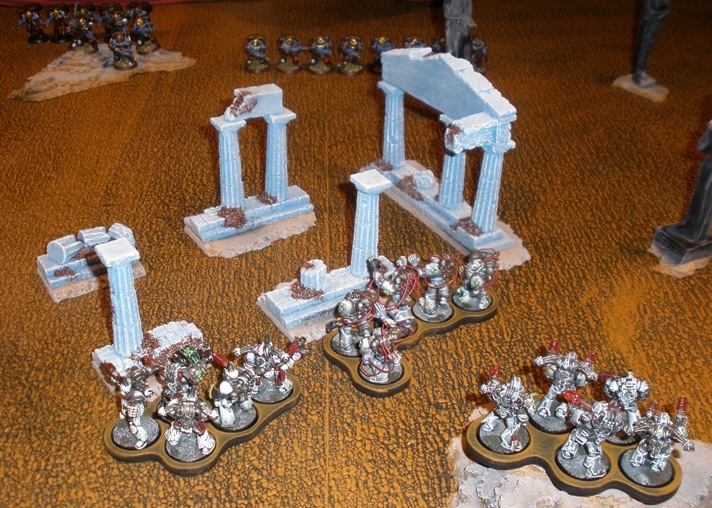 Sin Eater Havocs moved in from the South West and deployed their heavy weapons to cover the altar. A solitary Plaguebearer was all that remained of the unit as the troupe disengaged ready to charge in again. The armoured bikers were too tough for the guardians who were wiped out after a protracted fight. 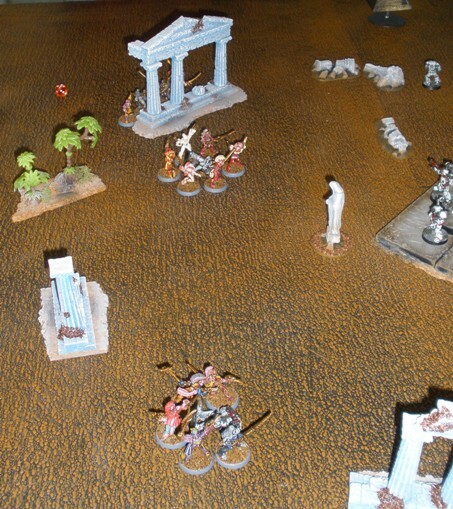 More Guardians came through the Webway portal just as the Bikers finished off the first Guardian squad while the surviving Harlequins circled the altar ready to assault. 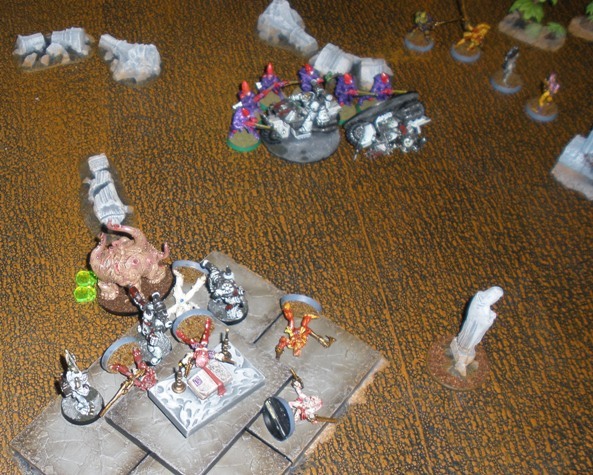 …but a Chaos Spawn congeals out of nowhere and lands behind the surviving troupe. 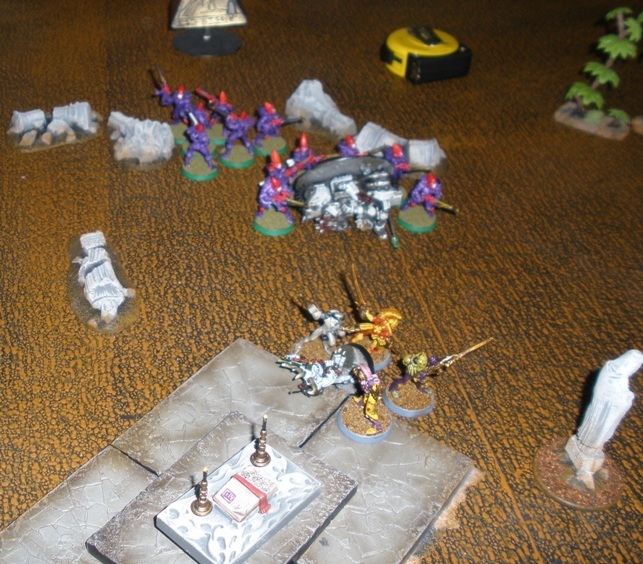 It looks bad for the Eldar. 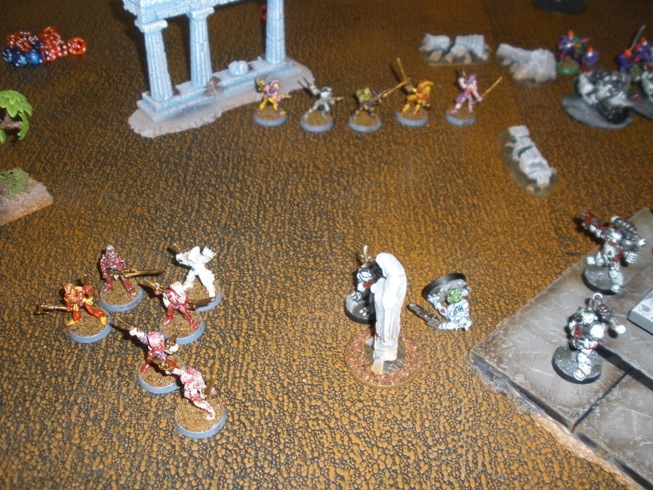 The Harlequins on the altar are killed by the remaining Plague Marines, Chaos Spawn and solitary Plaguebearer. 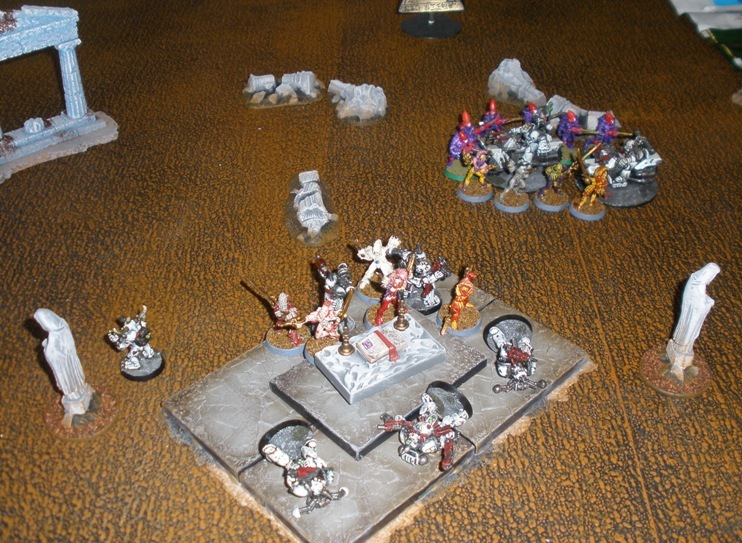 The Harlequins backflip out of combat with the bikers as the guardians kill another, leaving only the Sergeant. This frees up the last Harlequin troupe to rush back towards the altar. Unexpected supporting fire from the final Guardian squad that just warped in proves lethal in combination with the Harlequins sidearms. 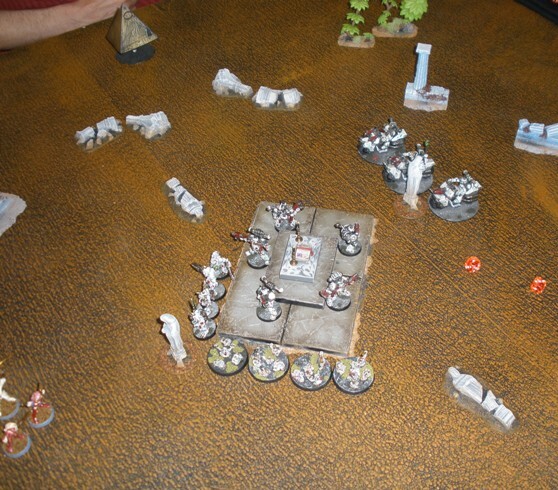 The Guardians finally tear the biker sergeant from his saddle and riddle him with close range shuriken fire while the remnants of the last troupe send the final daemon back to the hole that spawned him. Bloody but victorious the Eldar prepare to set explosives and counter wards to ensure that the altar can never be used again. Although at this stage we were tiring of our trip down 40k memory lane, with all of its dead ends and turn offs that go nowhere and for no real reason, that game ended up being quite fun, if a bit linear and predictable. It was close in the end and it was evocative of the source material. That is the most that we could have hoped for in fairness. Part 1 with some preamble is here. There was only a little bit of vague information about Eldar Pirates in the Rogue Trader book before White Dwarf 127 brought in swathes of background and info regarding the Craftworld Eldar. Before that the only Eldar worth talking about were the Harlequins. 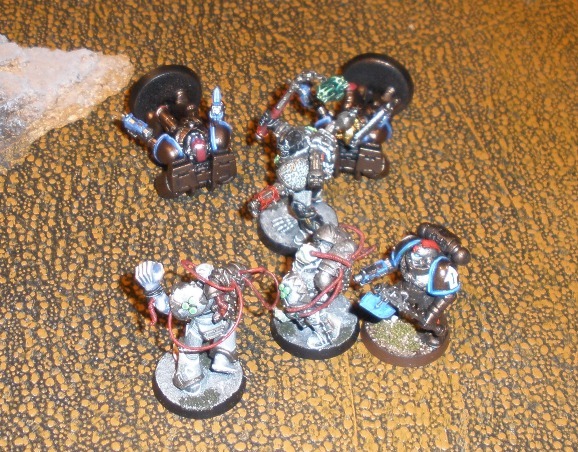 Last year MT painted up a bunch of Harlequins that he had traded with me years ago which were last seen in a Space Hulk here. 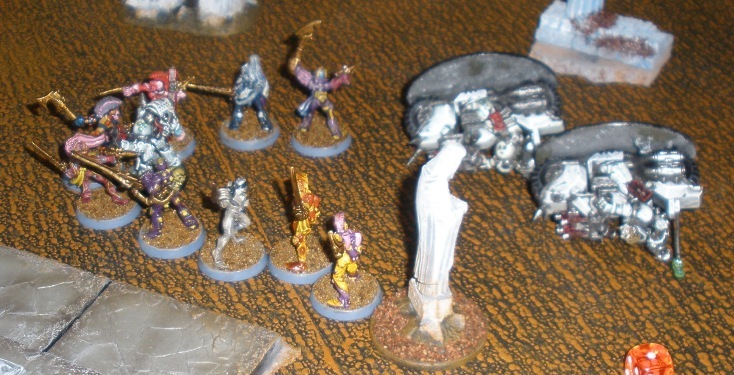 Despite how cool the original Harlequin stuff was back in the day neither of us had been involved in a game using them (apart from a few abortive attempts to use the silly Harlequin list from the Citadel Journal circa 2001). The current Eldar Codex and the new Dark Eldar Codex both have rules for Harlequin Squads that looked good to us. It seemed like GW had finally got the Harlequin power level right: stylish and effective rather than bland and ineffectual (Eldar Codices 1 and 2) and playable rather than broken (Citadel Journal Harlequin list). 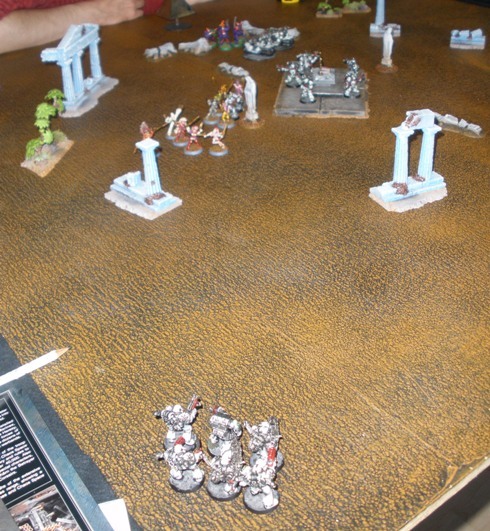 So we were pleased to be able to finally play a game of 40K with them so many years later. 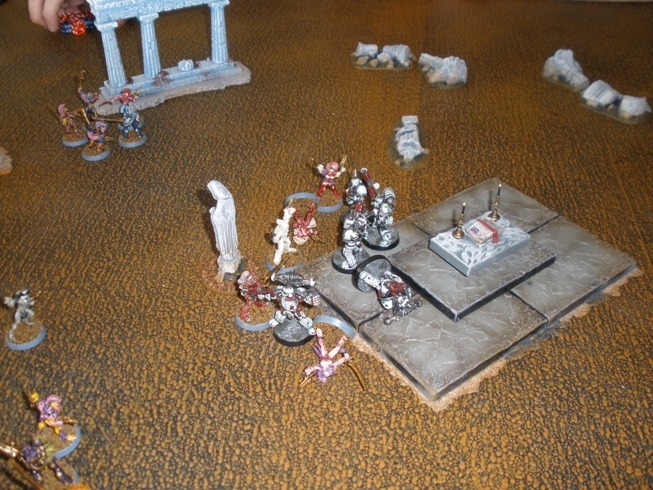 We set up an Altar of eeevil in the middle of the table with Sin-Eaters holding it and four Chaos Marine sentries surrounding them. 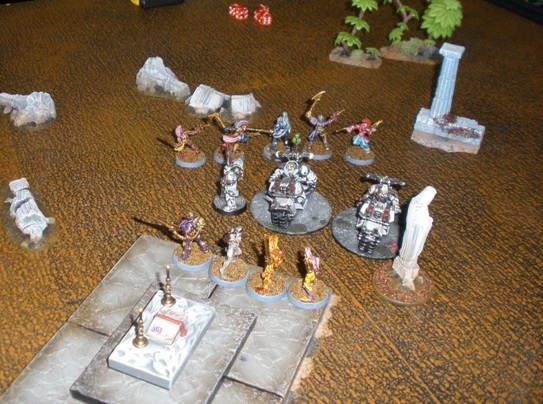 We decided to play a second, more involved scenario with daemon summoning etc after this one, once we had an idea of how well the Harlequins functioned. This game was to be all about how the Cosmic Elf Ninja Clowns work in their current form. The Troupe started off on the Western edge. With all of the panache that one would expect from a group of almost immortal space ninja elves devoted to a god of violent deception, a pair of Chaos Marine sentries were silently bumped off. 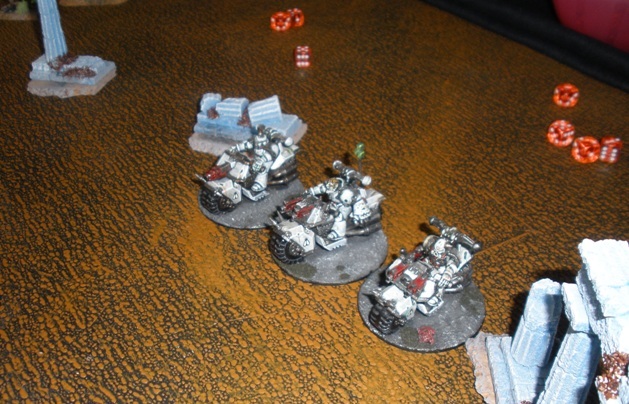 A trio of Sin-Eater bikers rush in from the East in response. The irresistible force of the Harlequins meets the immovable object of the Plague Marines. Something had to give. It turned out that the Plague Marines caved to the flurry of attacks brought about by the Harlequin ability to Hit and Run. Say what you like about 40k, but it felt just right, one of the rare marriages of the background and the game mechanics in action. 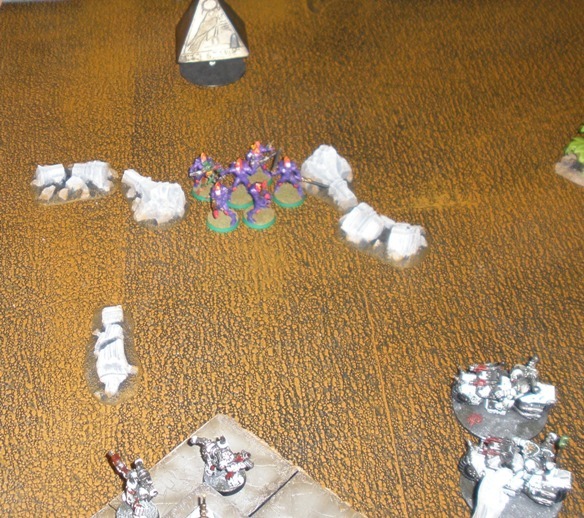 The last Plague Marine regrouped with the depleted biker squad, but the fight was gone out of them. Their indistinct would-be assassins encircled. 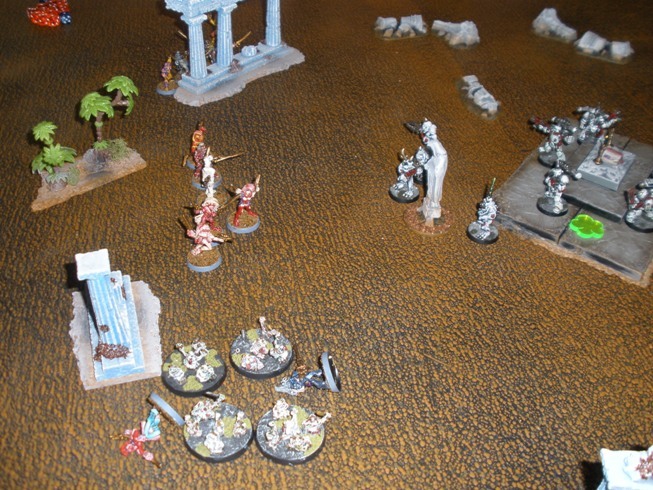 The last of the Chaos forces were wiped out and the Harlequins won by a large margin. Conclusions: Already a number of the tried and utterly untrusted mechanisms of 40k were starting to wear thin. We glossed over these with the wave of our hands and the application of hazily remembered other rules from the various editions of the system over the years. This kept the game going, but obviously wasnt ideal. Also the IGo/UGo nature of the game felt scripted and dull. On the plus side it was nice to play with Harlequins that felt like how we thought that they should feel after all these years (thin and muscley with an excellent skincare regime in case you were wondering). Digging out older figures that havent seen the light of day for a while (like the Sin Eaters) for a game is always a little bit of a kick. The fight between the Harlequins and the Plague Marines on the altar was evocative because of the thinly applied setting/scenario and because the rules actually helped the events to feel authentic. This is a main goal for me with miniature games so that was a big plus. Parts THREE, FOUR and FIVE. 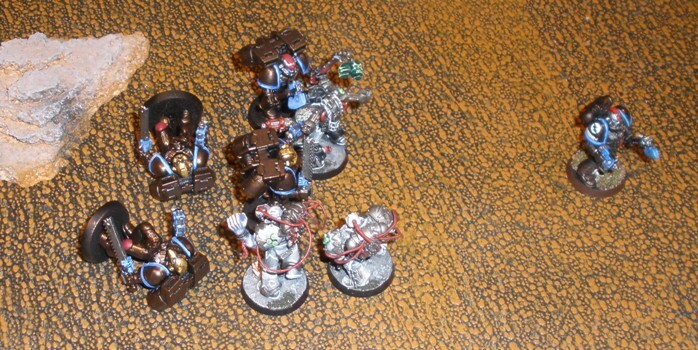 I have had a love/hate relationship with Warhammer 40000 since 1989. Although I played a lot of games in that setting for years, I finally put it to one side in the mid 2000s. I stopped reading White Dwarf, stopped buying Codices and stopped painting 40K figures. I love the daft futuristic dark age setting but the games themselves extremely rarely lived up to the potential set by the background and so, that was that. To make a long story short-ish, a few factors combined recently (namely the Horus Heresy series of novels, the totally unsuspected GW re-release of Space Hulk and the Fantasy Flight Warhammer/40K themed boardgames etc) that gradually worked on my subconscious to the point that I planned a gaming weekend with the main emphasis being on playing some small (400-600pt) games of 40K. I guarantee that I am more surprised at this than you may be. Despite my 180 degree turnaround on earlier standpoints regarding my willingness to play games of 40K at all, I still wasn’t prepared to play the rules as they are currently written. Long time game co-conspirator MT and I decided to play using a hodge-podge version of the rules based mostly on our favourite 3rd edition, except where we didn’t want to because we felt that newer rules were better. None of the rules selected as “better” were written down in advance. Needless to say, that made this is an imprecise art, best only attempted by players that have successfully played the game together for a long time and who are not obsessed with trying to screw each other over. I decided to play with MT anyway (thats a joke, geddit?) 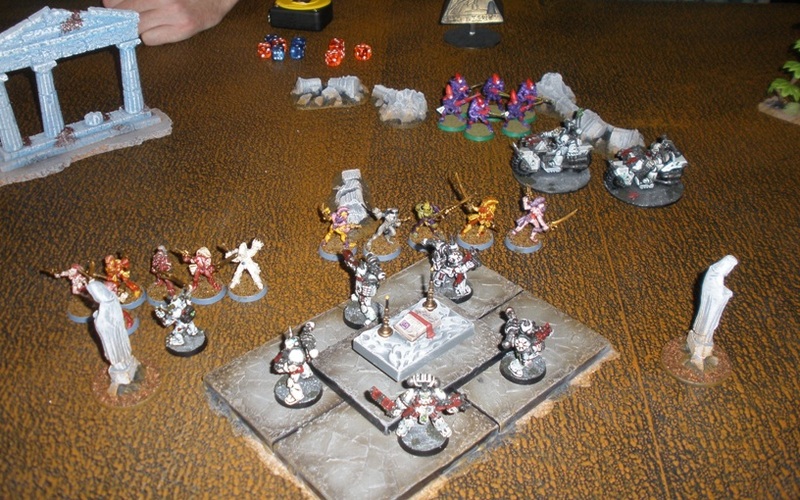 Despite the fact that “jamming” with rules sets isn’t really our scene and the high potential for friction it worked out for us for these games. 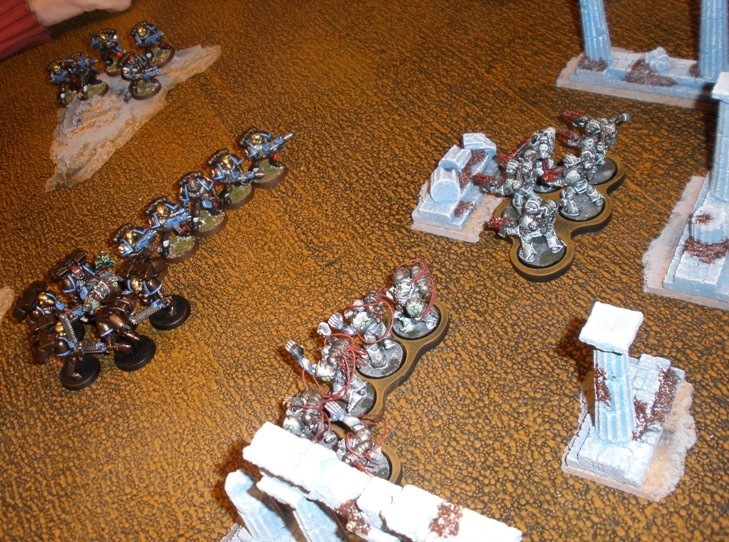 We mostly played scenario heavy games, rather than the line-them-up-and-knock-them-down dice fests that 40K is infamous for. This short series will document a small number of those games, mostly pictorially. As this was the first game that I had played for a very long time we decided to go with a quick scenario-less game first of all. 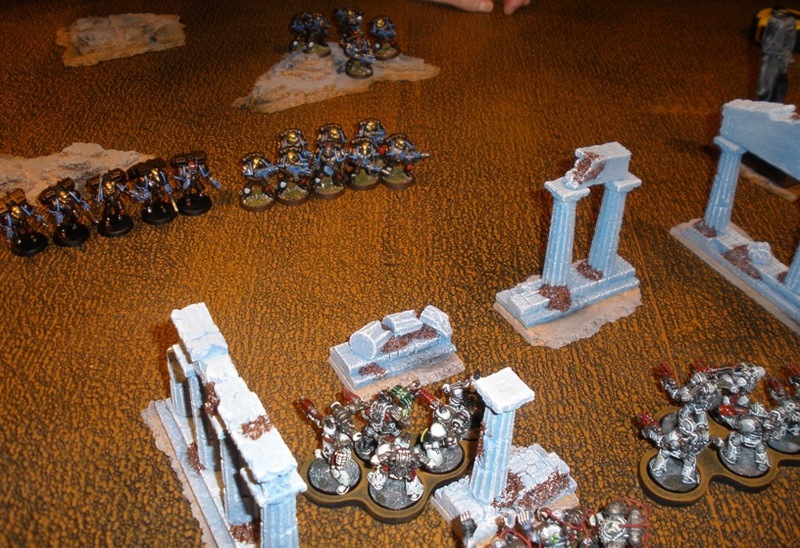 Unsurprisingly both sides moved towards the middle, with the exception of the Emperors Voice Devastator squad who too the high ground in their deployment zone. So far, so predictable. The Sin Eaters Plague Marine Squad Klaus and Possessed Squad Nemesis along with Squad Van Helden took cover in the ruined temple. 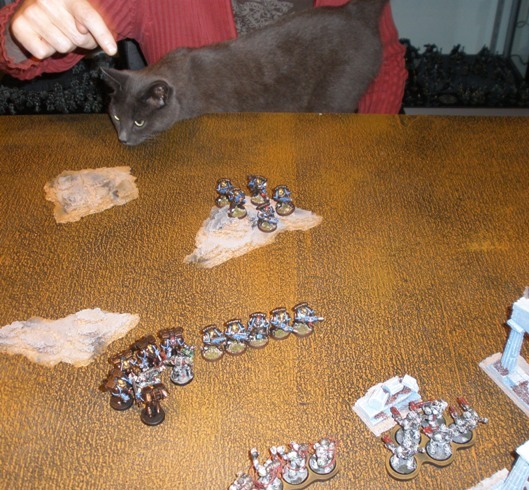 Plum the cat observes the Emperors Voice force form a firing line ready to receive the inevitable charge of the more close combat orientated Chaos troops. Sgt Klaus (with Klaus played by Brother Bakul in this instalment) is the only surviving member of his squad to reach the loyalist lines, where he begins to make them pay by bludgeoning them with his power weapon. Chaos firepower almost wipes out a squad of loyalists, while Squad Nemesis is reduced to two survivors from reciprocal shots. 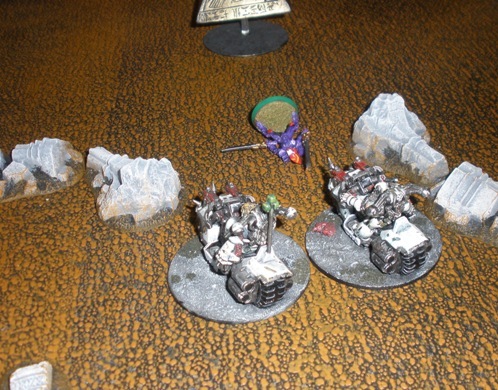 Sgt Klaus shrugs off the assault marines attacks against his bloated undead and armoured hide and kills a marine. 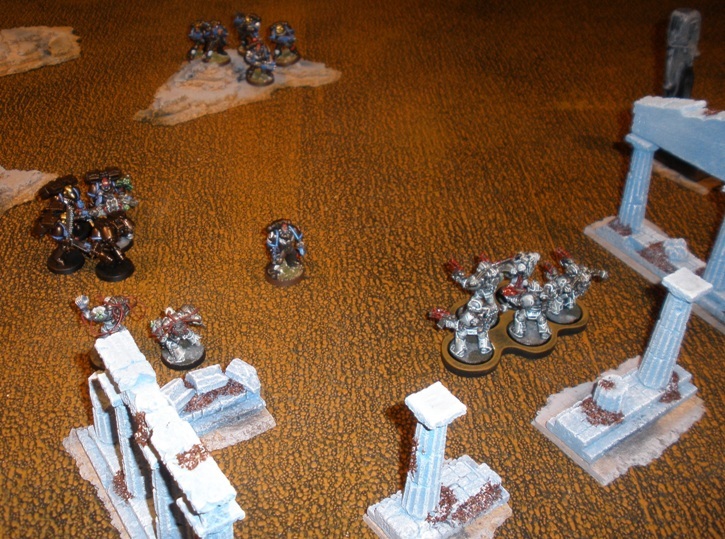 The remnants of Squad Nemesis combine with Sgt Klaus to kill another pair of Assault Marines. The Tactical Sergeant kills the two Possessed with his power axe but Klaus kills everything in the area including the Tac Sarge. Standing in the open and covered in gore, Klaus screams his defiance at the heavens. Then the Devastators on the hill finally get a target again and blow him into rotting, slimy chunks with heavy weapon fire. Conclusions:In theory, having a large number of units in a game can provide some redundancy so that odd changes in fortune can either be exploited or countered by units held for such a purpose. That’s the theory anyway, it never applies to games of 40K as the armies are set up so close together and have been min/maxed in such a way as to render thoughts of tactical or strategic play more or less redundant. It’s a game of point your guys in the direction of the enemy and press “Go”. This effect is exaggerated by smaller forces like those that we were playing with. 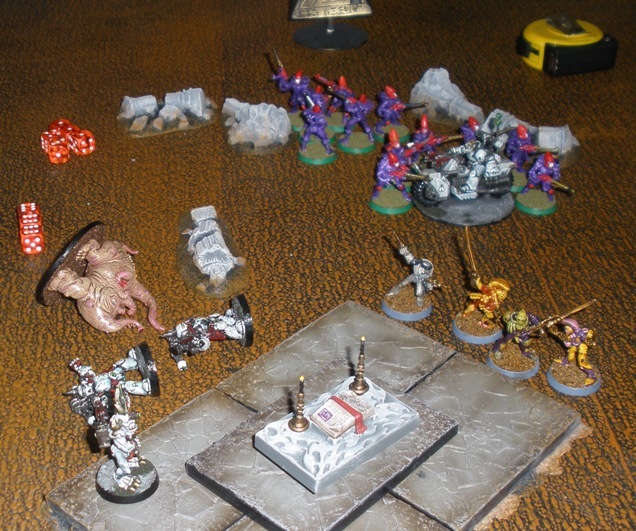 That said, that game was essentially a standard game of 40K in microcosm. Parts TWO, THREE, FOUR and FIVE. The Zompocalypse Will Be Televised. These two figures come from the limited edition Frothers sculpting competition winners from last year. As far as I know they havent been made available anywhere else since, but I could be wrong. Its a pity if they havent as they are really very nice sculpts. 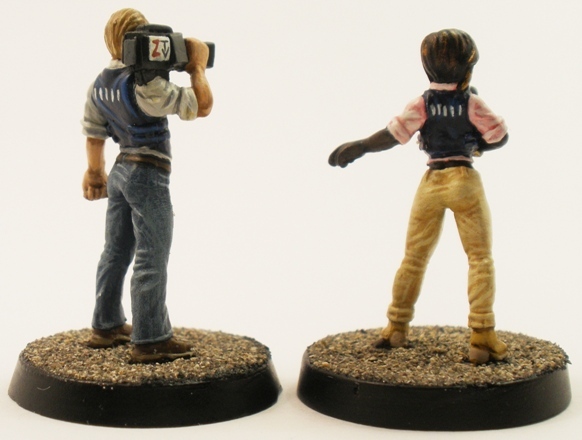 I have seen pairs of reporters in 28mm a couple of times before, once from EM4 and once from Copplestone Castings. While those figures are also great its the body armour on this pair that makes them stand out a little. Despite the inherent daftness of body armour that fashionably exposes the wearers midriff, the body armour and reporting-from-a-warzone look is very appropriate for a zompocalypse game. Some real life press in body armour have “PRESS” written across their gear. I didnt have the patience to paint that on to the figures so I settled for five white lines on each of their backs. From the distance that the figures are viewed from on the table it really is much of a muchness anyway. Reporting live from the hot zone. The paint job on these turned out ok (apart from the fact that I forgot to finish the face of the female figures watch before I took the photos). To be honest painting the pair was a chore for a few reasons unconnected to the figures themselves. Between daylight bulbs on my painting lamp blowing at inconvenient times, spilling the entire pot of one of the paints that I was using all over my painting area and finally dropping and breaking the cameraman on the floor when the painting was nearly finished, for a few weeks it looked like these figures were destined to remain unfinished forever. As such I am happy that they got to this stage at all really. 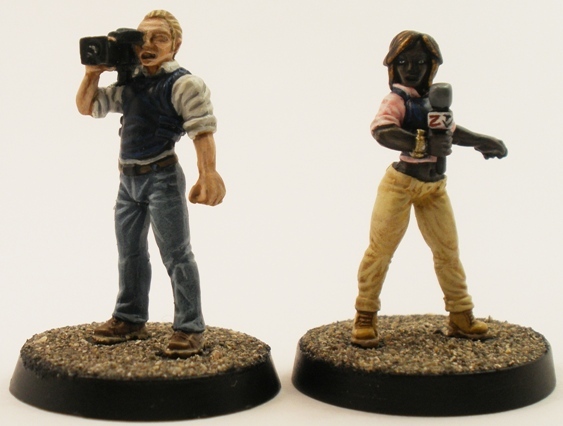 I plan to use the News Team as special objective pieces in games of (Sho.R.T.) AR:SE. They could also feature in other games in a variety of usually scenario specific roles.